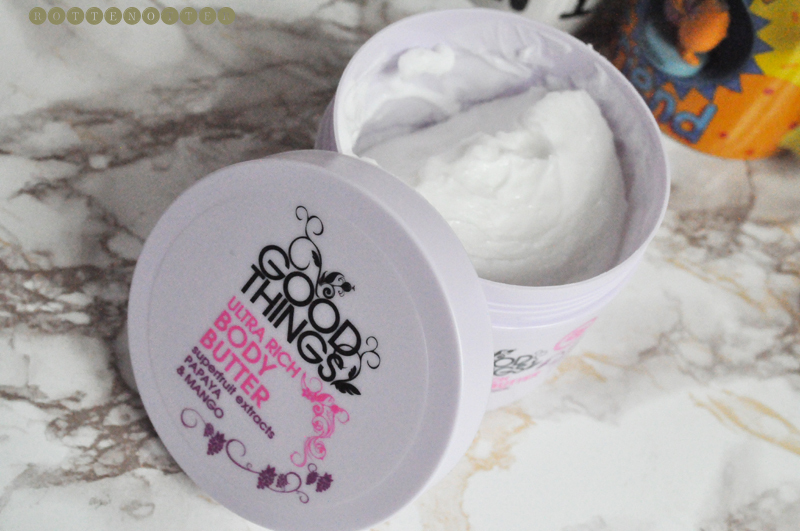 This body butter* from Good Things was an essential for me during winter. My skin was dryer than usual so I found myself using this on a daily basis before bed. It's really thick and incredibly moisturising. A small amount of this goes a long way and it sinks in really nicely. If you come across this in store, have a smell and I'm sure you'll be impressed. I know I was when I first opened it. It smells of pomegranate, red grape, mango and papaya. It's really strong and stays on the skin for a while. This 300ml tub costs £5.99 which is a bargain compared to The Body Shops Body Butters which are £12.99 for only 200ml. Good Things are available from Sainsburys, Boots and Superdrug, in stores and on their websites. It's definitely a brand I want to try more from. I'm thinking the other body butter and scrub are what I'm most likely to try out next.